Dengue virus (DENV) is an enveloped virus of which there are four co-circulating serotypes (DENV1-4), which annually give rise to 50-100 million infections. Primary infection with DENV results in a febrile illness. Secondary infection with a different serotype often leads to severe disease: Dengue Hemorrhagic Fever or Dengue Shock Syndrome, via antibody dependent enhancement of infection (ADE). An ideal vaccine should elicit a balanced and broadly neutralizing antibody (bNAb) response to avoid complications arising from ADE. We are engineering immunogens that have favorable immunogenic properties based on domain III (DIII) of the glycoprotein E from DENV-2 using phage display, a technique that allows for the rapid screening of thousands of variants of a protein (Figure 1). Figure 1: The process of selection. An initial phage population composed of many different variants of a protein expressed on the surface of bacteriophage are bound to a target. Unbound phage are washed away, and bound phage are eluted and readily amplified by infecting E. coli. 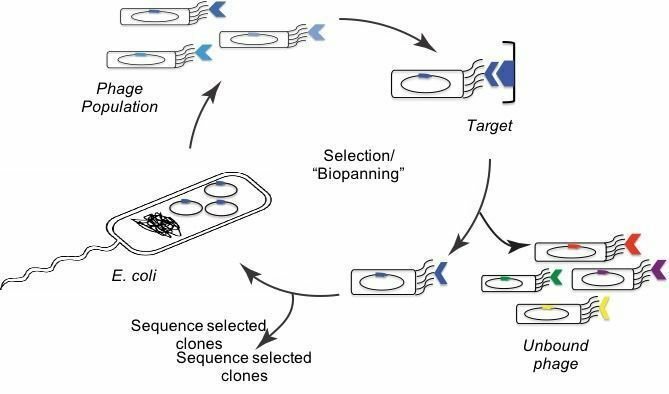 Selected clones can then be sequenced and analyzed further. Mouse immunization studies using WT DIII, resulted in sera that were cross-reactive, but not broadly neutralizing, with antibodies primarily targeting the AB-loop. In order to focus the immune response on the broadly neutralizing AG-strand epitope, we sought to resurface the AB loop and surface-exposed residues of DENV-2 DIII (Figure 2). Figure 2: A) In order to resurface DENV-2 DIII, residues of that are either part of the AB-loop or surface exposed were allowed to vary among Alanine, Serine, or the WT identity. B) Two DIII variants (Ala-11 and Ala-30) were found to have 5 or 6 mutations relative to WT, respectively and maintained binding to the broadly neutralizing antibody 4E11.